You must not post the requested information on the forum in public under any circumstances. This will only work if the security option of not sending the password for administrators and moderators is disabled. If this option is activated on your forum, check step 2. 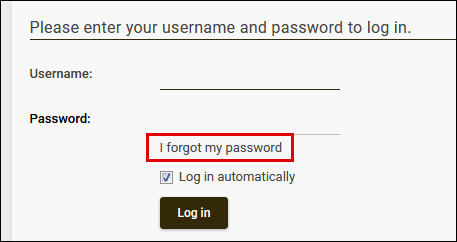 If this is the case, when you try to connect to the forum, click on the link "I forgot my password" (example). You can also access it at this address: http://forumaddress.forumotion.com/profile?mode=sendpassword taking care to replace forumaddress.forumotion.com with your forum address. If the option preventing the sending of a new password to administrators and moderators is enabled, go to the founder's tools (click here). Log in with the foundation email OR the forum address and password. Generally, unless you have changed it later, this will be the first password used on the forum. Once logged in, you will be able to access the "Forum security" section, where the option can be disabled. 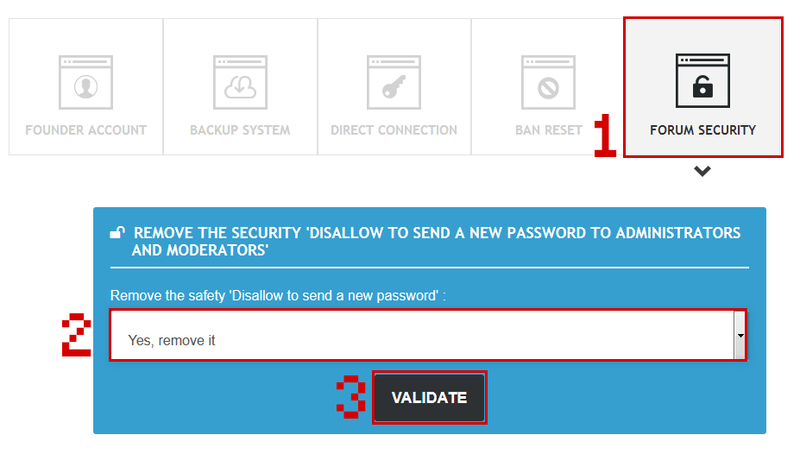 Disable it, and repeat the previous step from the forum login form (step 1). If you can't remember the password needed to login the founder tools, please check the next point.